Why Donate Your Vehicle To Us? First we are very different than the vast majority of charities that ask for your vehicle donation. Most other charities never see your donated car. When you contact many charities you are reaching a call center in another state who takes your donation information and then relays it to a local towing company. This tow company then takes your vehicle directly to an auction where it is sold “as is” for whatever the auction can get, without improvement of any kind, and often only car dealers and wrecking yards are allowed to bid at these auction, so vehicles frequently sell for peanuts. We on the other hand are here in Las Vegas, we pick up your vehicle with our dedicated tow truck and then take it to one of the shops we work with here in town to have it diagnosed. Typically 99 cars out of 100 we receive require major repair; motor replacement, transmission rebuild, body and paint work, air conditioning or smog repair, you name it. Over the years we have established many contacts and resources to get vehicles repaired at a fraction of what the public would pay. Because repaired vehicles bring us much more revenue than broken down vehicles, we spend the money to improve about 3/4 of the vehicles we receive in some fashion, whether paint, tires, exhaust, glass or mechanical repairs. Only about ¼ of the vehicles we receive are not financially viable to fix and sold to salvage yards, we really try to fix as many as we can because the difference in revenue can be staggering. For example, a car that has very faded paint and non-working AC might only be worth a few hundred dollars but that same car with new paint and repaired AC might bring us $2,500 when sold to the public. So even if it costs us $600 to paint that car and repair the AC, it still brings us $1,900 more revenue as compared to the $400 to $500 we might get for that car in the condition it was in when donated. And we repair just about anything, autos, aircraft, motorhomes, boats, golf carts, large construction equipment and semi-truck tractors. Try us first, we take more donation types than just about any other organization. . Our organization has its own local donation program and is not affiliated with any national fundraising operation, including the National Paralyzed Veterans of America vehicle donation program. This repair policy also makes a huge difference for your tax deduction. The IRS states in their flyer “A Donors Guide to Vehicle Donation, Publication #4303, (which we recommend that you consult on the IRS website) that; “Generally, if the charity sells your vehicle, your deduction is limited to the gross proceeds the charity receives from its sale.” They do NOT require that you take into account the money we spend on improving your donation, so if we sell your vehicle for $2,500 you can take an itemized deduction for $2,500, regardless if we spend $6 or $600 to fix it. Many donors are shocked at the deductions we are able to get them for their previously unattractive, problematic cars and call in to tell us so. We also advertise and sell your vehicle to the public from our donation sales lot at 4000 Boulder Highway, we do not auction your vehicle off. We set pricing for the maximum value we believe we can get for your vehicle and still sell it in a timely manner, generally within 6 weeks or so and often for much more than the “Blue Book” price. By “retailing” your vehicle we typically get 2-3 times the amount it would bring at auction because buyers can start the cars up, check them out, bring their mechanic, mull it over and they are buying nice looking, detailed, smogged cars. This translates into a comfortable transaction for the buyer and a MUCH greater tax deduction for you. There is no “Guestimating” the fair market value of your donation yourself as recommended by some other charities. By selling your repaired vehicle there is ZERO debate as to its value, the IRS will not challenge the sale price method of valuation. And in those rare instances where an appraisal is necessary such as with year-end donations, we will provide you an appraisal/deduction value at our expense. Once we sell your vehicle we will send you an IRS form 1098c within 30 days of the sale showing the sale price. From our experience and comments from donors who donated to other charities, the vast majority of vehicles donated to other charities receive a donation receipt in the mail limiting the deduction to $500 largely because that requires much less paperwork from the charity, only a simple donation receipt. We go the extra mile to fill out and send you the 1098c for vehicles sold above $500, and most vehicles we sell go for over $500. With the donation receipt we give you at the time of pick up you have immediate proof that the vehicle was transferred to us and that you are no longer responsible for the car, so it is important that you retain the donation receipt in your records. You may take or mail a copy of our donation receipt with your license plates to the DMV, they will register the transfer and give or mail you a surrender receipt, so you know the vehicle was transferred out of your name. We can also take your plates to the local DMV for you, we are glad to do that and most people choose that option but the DMV will not give us the surrender receipt, that can only be given to registered owners due to Nevada privacy laws, still if we take your plates to the DMV the registration is immediately canceled in their records. You can cancel your insurance immediately after receiving your donation receipt from us on the day of donation. You may also report the transfer on the DMV website but the release of liability is not complete until the plates are turned in and the DMV allows 60 days for that (30 days for specialty plates). Or you have 60 days to transfer the plates to your next vehicle if the registration is still valid and not expired. You do get credit for the unused portion of the registration towards the new registration of your next vehicle, which will save you some money depending on the time left on your current tags. Once you sign the title over and we give you the donation receipt, at the time of pick up, the car is ours and covered by our insurance. Do you really want to wait 4-6 weeks for your donation receipt to come in the mail from some other charity? Or maybe not come at all and you have to make phone calls to track it down while still paying for insurance on your car? We hear that story a lot. All of our operations are located here in Nevada so we support local vets with the funds raised, we support local businesses who supply repairs and parts and we hire local workers in our operations. Do you really want the revenue from your donation to go to a company in Florida, Michigan, California or some other state, or would your rather support local veterans, businesses and workers? How Do We Support Veterans? Deliver food including fresh produce to an average of 30 disabled Veterans a month..
Fund 3 scholarships for the children of disabled veterans to attend college. 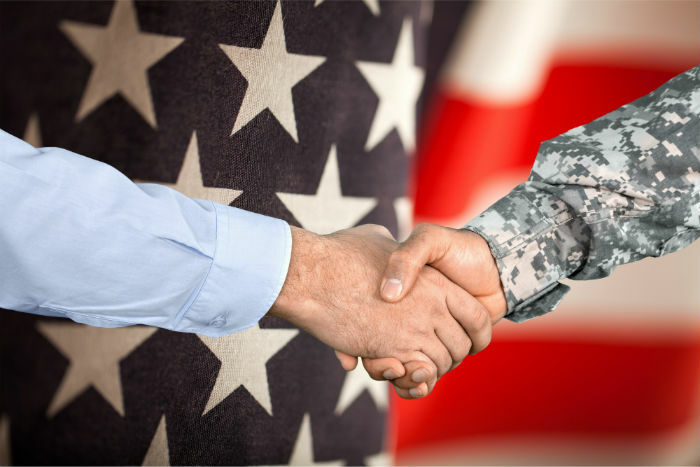 Assist veterans with VA claim filing and securing benefits here in Nevada. 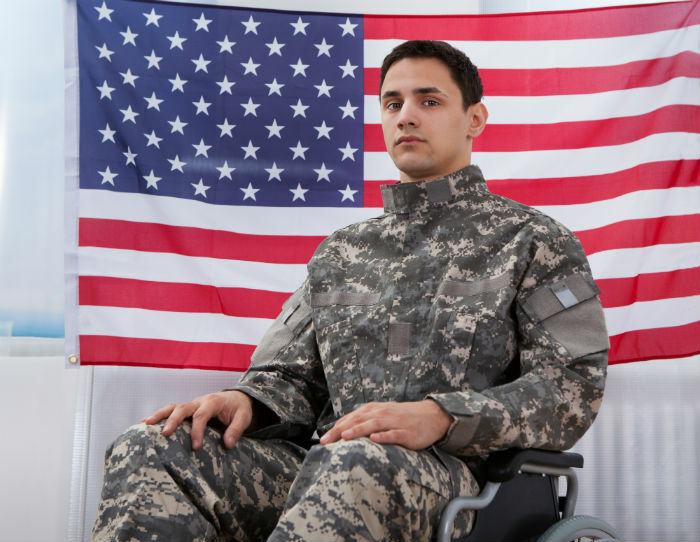 Provide medical equipment such as scooters, replacement batteries and ramps to veterans at no cost to them. Sponsor social and sporting events to encourage involvement, camaraderie and physical fitness and reduce isolation. Sponsor wheel chair basketball teams, youth Paralympics and military sports camp. Provide Hygiene kits to an average of 400 recipients at our annual Veterans Service Fair, generally held in October. Because we strive to repair as many vehicles as possible, our costs are much higher than with other charities who simply send your vehicle straight to an auction, and everyone who works full time in vehicle donation program is paid, but the highest paid person, the donation program coordinator receives about $50,000 annually, so no one is getting rich off of this operation. Can other charities make that claim? 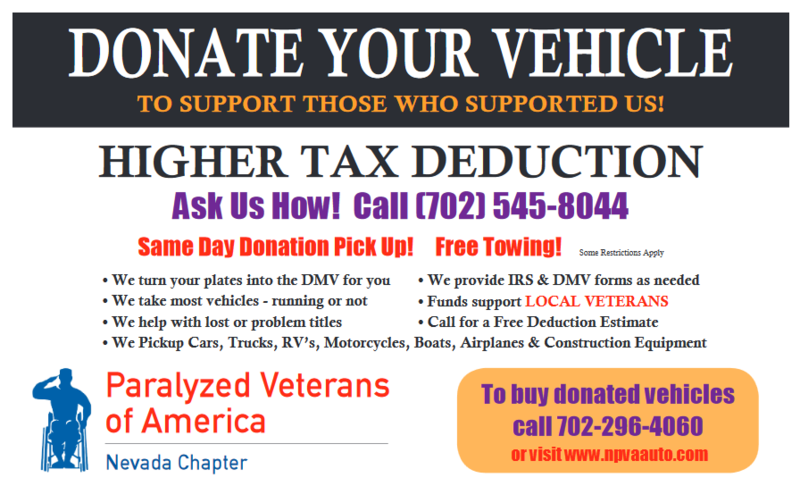 Once all the repairs, advertising, towing, rent, utilities and similar related expenses are paid, an annual average of 87% of the net revenue remaining from vehicle donation sales goes to charity programs to benefit veterans. Some of the restrictions that apply when donating to us are as follows; we cannot pick up abandoned vehicles but we will assist with lost or problem titles in your name. We can only take vehicles that are readily towable and local, within about a 2 hour drive, although we make every effort to take vehicles that are distant and challenging to tow, especially more valuable vehicles or classics that may have been sitting for decades. We pick up cars 6 days a week, excluding Sundays, typically between 9:00 and 4:00 although we accommodate hours outside that normal range. We do get booked up some days and cannot always come the same day you call, but normally we can. Calling a day or two in advance generally allows you to pick whatever time of day you want. We decline very few vehicles but sometimes there are those that we simply cannot benefit from such as motorhomes that are in poor condition or dismantled, boats in poor condition, vehicles with no paperwork of any kind or unknown ownership. We will also need the vehicle keys unless it is an older vehicle that does not have a steering/shift lock, or does not use keys. We have an 11 year history of providing a smooth donation process and frequently creating very pleased donors often far beyond their expectations. We regularly receive calls complimenting us on our courtesy, paperwork and personnel, even the DMV has complimented us on our handling of their paperwork. No donor that we are aware of has ever been challenged on their tax deduction or had their deduction value reduced. We believe we supply the most beneficial operation any donor can find. Won’t you give us a call for a free deduction estimate over the phone? We think you will be pleased with our professionalism.